used. For nearly another twenty years the morning worship services were Norwegian, whereas the more informal evening services were English. By 1940 it was no longer possible to get a pastor able to use both languages. By this time, too, there were many members who knew only English so the change was necessary. There were still those, however, who felt the message of the gospel could not be interpreted as well in any but the Norwegian language. As Immanuel Church in Clanwilliam was the larger congregation those first years the parsonage was built beside their church in the country. Ever since the car had become the pastor's only means of conveyance, during the long winter months he had to travel by train each fortnight for his work at Bethel. Train schedules were not the most convenient either. By the 1930's this was the larger congregation, so a decision to provide a home in Erickson was made and the parsonage was ready for occupancy in 1942. This was the only Lutheran Free Church parish in Manitoba, and was part of the Canada district of that body which had its head office in Minneapolis, Min­ nesota. The nearest sister parishes were in western Saskatchewan, a great distance in those earlier times. In 1939 a transfer was made to the Rugby District of North Dakota, so a regular program of fellowship resulted until 1963. In that year the L.F.C. merged with other Lutheran bodies to become the American Lutheran Church. 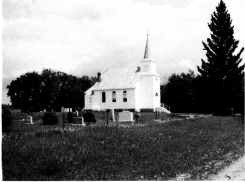 This parish then became part of the Manitoba Conference of the Canada District of the A.L.C. and part of the large number of Lutheran bodies in Manitoba, much of which had been of German origin. member allocations and money raismg functions. However, with gradual education in the stewardship of God's gifts, this concept gradually changed, and the use of envelopes each Sunday was introduced. Members of Bethel who have gone into the full time ministry of the church are Sigurd Berg, Delmar Gusdal, and Dolores Hall. In his later years, Edwin Hall served in the lay ministry of the Presbyterian Church, and at the present time Elgin Hall is serving as a lay minister in the United Church in Onanole. Anniversaries were observed regularly through the years and these were times of homecoming and reunion, times of rejoicing in the fellowship of the church. The seventy-fifth was observed in June of 1982 when many of those attending were fifth generation descendants of charter members. A heritage that is mighty and eternal had been passed on through the years. The pastors who have served during the years have been: S.O. Vangstad - 1906-20, G.O. Sather - 1920-21, G.P. Ronholm - 1922-27, R.H. Larson - 1927-30, G.G, Lee - 1930-37, George Amundson - 1938-41, A.H. Sevig- 1942-45, R.A. Hanson - 1946-48, 1.1 Nystuen - 1949-55, 0.1. Johnson - 1955-60, 1. Fredriksson - 1961-64, O.E. Bruun - 1965-70. Being conscious of the importance of training and teaching the children, for many years from four to six weeks of parochial school was held each summer. In 1924 this gave way to a regular Sunday School program except during the winter months. Daily Vacation Bible School was conducted for a week in the summer in later years.